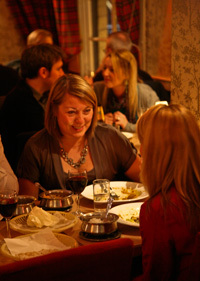 Set in Glasgow's Ashton Lane, a picturesque location in the heart of the West End, The Wee Curry Shop continues to offer the unique range of Indian cuisine only available from their individual menu. From the very freshly prepared starters to the house speciality main courses, there is a dish to satisfy every palate. Select a refreshing drink from the licensed bar, or if you prefer bring your own bottle. * We are sure that your experience in The Wee Curry Shop will be a memorable one. THALI MENU is available until 2:00pm (Mon-Thu) & 3:00pm (Fri-Sun). To reserve a table please contact us on 0141 357 5280. *Our bring your own bottle policy applies only to wine and champagne. Only one bottle per two customers, corkage charges apply. For a limited time, get your copy of the Mother India At Home cookbook. It's available at the Ashton Lane restaurant and is sure to please. You won't find the Mother India recipes anywhere else, so get your copy today!